Focus points of the Elmasonic S 50 R and S 350 R devices are test sieve cleaning, HPLC-solvent degassing and laboratory applications such as the removal of difficult to dissolve substances, emulsion manufacture and the reaction acceleration. For the different applications like sieve cleaning, degassing, sample preparation and treatment, specially adapted ultrasonic programs were furnished. 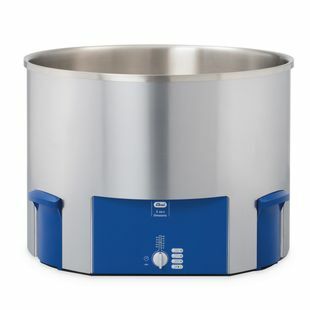 The user can activate the correct ultrasound parameters using “sieve cleaning”, “degas” or “sample preparation” easily and quickly by pressing a button and the machine operates in the respective stored ultrasonic mode. Correct filling of the machines is simplified thanks to filling level marks in the bath. The special Degas function switches back and forth between maximum power and a mode that drives out the now macroscopic bubbles upwards via a lift-out effect. The special “sieve cleaning” function enables a effective and fast cleaning of test sieves with ultrasonic shock waves. With this gentle ultrasonic cleaning (in contrast to manual cleaning), the fabric tension or the mesh size remains the same and the dimensional accuracy of the sieves is still 100% after cleaning. Due to the pre-programmed functions, the processes are standardised and easily repeatable. The function thus massively facilitate the laboratory work.